BEIJING (AFP) - China mounted a rescue operation on Tuesday after a passenger ship reportedly carrying 458 people sank in the powerful Yangtze river after being hit by stormy weather. Broadcaster CCTV said that one body had been recovered, and just 10 people rescued so far from the Dongfangzhixing, or “Eastern Star” which sank late Monday en route from the eastern city of Nanjing to the south-western city of Chongqing. In a report that raised hopes of more survivors, it said that rescue divers knocked on the boat and detected responses from inside, but did not elaborate. The cause of the sinking in the Jianli region of central Hubei province was not immediately clear, but CCTV said it was an accident. Among those rescued were the captain and chief engineer of the vessel, who both reportedly said it had been caught in a “cyclone”. There were 458 people on board when the vessel sank at 9.28pm (1328 GMT), CCTV said, including 406 Chinese passengers, five travel agency workers and 47 crew members. The Hubei Daily newspaper quoted an unnamed official with the Yangtze maritime affairs administration as saying that one group of passengers sent by a tourism agency in Shanghai were aged between 50 and 80 years. 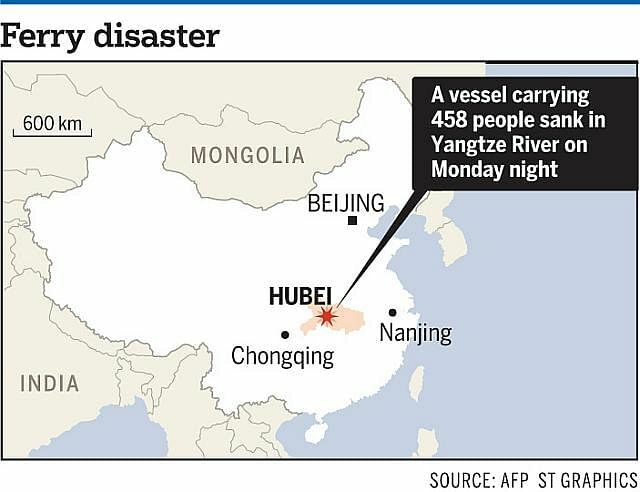 According to CCTV, the vessel – which measures 76.5m long in length – is capable of carrying up to 534 people, and was owned by a firm that operated tours in the Three Gorges dam region, which is some distance from the accident site. The sinking occurred in the middle reaches of the Yangtze, which at 6,300km is China’s longest. Xinhua news agency said China’s President Xi Jinping issued an order for “all out rescue efforts” to proceed while Premier Li Keqiang deployed a work team from the State Council, China’s cabinet, to direct the search and rescue work. Li, together with Vice Premier Ma Kai and State Councillor Yang Jing, were on their way to the site, the news agency said, adding that the transport ministry and other departments were told to throw all available resources into the rescue. China’s Communist Party leaders are sensitive to the handling of disasters as any missteps or delays can lead to criticism of their effectiveness to govern. Xi also called for officials to heed lessons of the past and to take more effective measures to protect people’s lives, Xinhua said. Reaction to the the sinking was relatively muted on Chinese social media, though some critical voices emerged. On Sina Weibo, a Chinese version of Twitter, one user complained that the TV coverage was insufficient. “When the South Korean ship sank, it was on TV 24 hours a day,” the user posted, referring to the Sewol ferry disaster in April last year. That ship was carrying 476 people when it went down off the southwest island of Jindo, killing 304 people, 250 of whom were pupils from the same high school. China’s high-speed trains and air networks are the backbone of national transportation. But recent maritime accidents include the January sinking of a tugboat on the river between the eastern cities of Jingjiang and Zhangjiagang, which killed 22 people including eight foreigners. After the January accident, the provincial government said the boat was undergoing trials without properly completing required procedures.